These gorgeous lamps can be used in a living room or a bedroom . They give a gorgeous glow through the cut out designs. Each lamp stands 26cm High. Got a question? Message Orange Grove Crafts. Item will be posted the following day after payment. 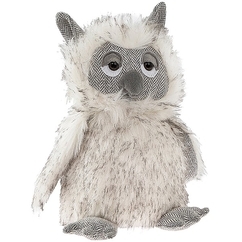 Gorgeous Heavy Weight Owl Doorstops In A Choice of 3 Colours Grey/ Brown /White Approx size 22cm x 16cm x 28cm. Lovely Soft Fur With Tweed Effect Material Faces . Ideal Gift For An Owl Lover . Please.. Stunning Silver Coloured Nickel Aluminium Swan Sculpture 39cm High This is a beautiful sculpture showing all the grace and beauty of the swan. Looks Fabulous as a stand alone piece on a table or Fireplace..
Silver-Effect Wall Mounted-Large-Branch-T-Lite-Holder Stunning 50 cm Wide This is a gorgeous piece looks so effective when lit (see picture ) Holds 6 T -Lights 50cm Approx Wide 43 cm approx Height..
Gorgeous Silver Sparkle Mother And Baby Penguin Ornament 19cm High. This is a lovely ornament. The pictures do not show how sparkly the item is it captures a mother penguin looking down on her baby..
Gorgeous Contemporary Gloss Red Cherry Ornament/Sculpture For Indoors Or Outside. These cherries have a lovely high gloss finish and are so unusual they are sure to be admired . Finished in a poly resin..
Gorgeous Silver Colour Modern Aluminium Tree Of Life Ornament On Stand 30cm High This tree looks lovely as a stand alone piece on a table or sideboard. Very Modern in design . 30cm Wide. Base size.. 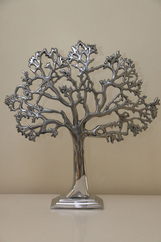 Stunning silver coloured aluminium modern tree of life design ornament on base 40cm high. This tree looks lovely as a stand alone piece on a table or sideboard. Very modern in design. 38cm wide. Base.. These gorgeous lamps can be used in a living room or a bedroom . They give a gorgeous glow through the cut out designs. Each lamp stands 26cm High. 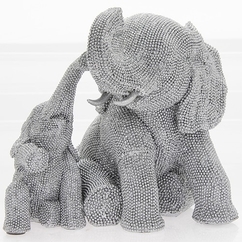 They come boxed and would make an ideal present..
Gorgeous Silver Sparkle Mother And Baby Elephant Ornament 18cm High Width 19cm. This is a Beautiful Ornament Depicting A Mother Elephant And Her Baby The pictures do not show how sparkly the item is..
Gorgeous Bronze Effect Reflections Dreaming Hare By Leonardo. Lovely detailed hare Approx 12cm Tall. Comes Gift Boxed Ideal Gift . 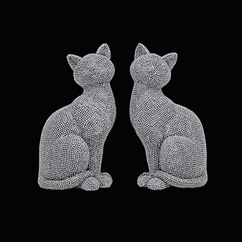 Gorgeous Silver Sparkle Cat Ornament 19cm high. This is a lovely ornament. The pictures do not show how sparkly the item is Would make a lovely gift or just to treat yourself. Comes Boxed. Price is..
Beautiful Reflections Brushed Silver Effect Resin Deer On Base 19cm High. Majestic Deer with lovely Detail. 19cm High Approx 17cm Width Felt Base To Protect Surfaces. Comes Boxed Makes An Ideal Present..